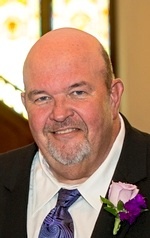 Elmer “Ray” Brunker, Jr., 62, of Olathe, passed away Nov. 24, 2016 at Olathe Hospice House. Visitation 6:00 to 8:00 pm Wed., Nov. 30, 2016 at First Presbyterian Church, 138 E. Shawnee, Gardner, KS. Celebration of Life 11:30 am Thur., Dec. 1, 2016 also at the church. Private family inurnment at Oakwood Cemetery, Baldwin City, KS. Memorial contributions may be made to Olathe Medical Center Charitable Foundation for Olathe Hospice House. Arrangements: Bruce Funeral Home, Gardner, KS (913) 856-7111. Ray was born Feb. 16, 1954 in Olathe, KS to Elmer Ray Brunker, Sr. and Betty June (Perkins) Brunker. He graduated from Olathe High School in 1972 and from Kansas State Univ. in 1976 with a Bachelor of Science Degree in Ag-Mechanism. Ray came back to farm with Elmer Ray Brunker, Sr. after college as Elmer Brunker and Son Farms, but later Incorporated to form Brunker Farms, Inc. in 1983. Ray served on the CO-OP Board in Lawrence, KS and was a member of the Kansas Soybean Assoc. for many years. Ray took on a seed dealership and warehouse in 1983 and continued that for 18 years. He was the fourth generation of the Brunker family to farm. Ray was a caretaker of the land he farmed. Ray married Jill Arlene Rogers on Nov. 12, 1983. After Jill’s passing in 2002 he later married Teresa Lynne Clark on July 5, 2008 in Gardner, KS. He loved to rescue dogs and make them part of the family. He will be missed by family and friends. He was preceded in death by Jill, his first wife and mother of his children in 2002 and his mother, Betty, in 2008. Ray is survived by his wife, Teresa, of the home; his father, Elmer Brunker, Sr., Olathe, KS; son, Charlie and wife Jessica Brunker and their children: Cheyenne, Colby and Callen, Ottawa, KS and daughter, Jeniffer and husband Travis Carmichael, Emporia, KS.